10th March, Manama: Andrew Frawley of Australia claimed the 2012 tour opening leg of the ABF Tour Bahrain defeating local favourite, Yousif Falah of Bahrain, 259-213 at the Ozone Entertainment Center on Saturday. The Aussie started off well with a double strike to take a 10 pin lead over his opponent, Yousif Falah as the lanky Bahrani could not response. Whilst Yousif had an opened frame in the sixth frame, Frawley went on a strike-fest reeling home seven consecutive strikes to close out the match with 259. Yousif did bring home four strikes in a row but it was too late ending his match with 213 allowing the Aussie to claim an emphatic victory in the season opening leg. "At my age, every opportunity to win a title, I'll gladly take it," said the 47-year-old Kuwaiti head coach, who gets an occasional chance to bowl in these tournaments. "My last win was way back in 2010 with the Thailand Open. It's a good feeling to get back on the top podium." The champion had earlier ended host chance of an all-Bahraini final when he ousted Fawaz Abdulla with a convincing victory, 248-225 in the second semi-final to reach the finals. Frawley also breezed through Round 1 by beating Bahrain's Masoud Saberi, 237-160 and another Bahraini, Mohammed Sultan, 205-195 in the second round. Yousif easily beat 2010 ABF Tour champion and three-time Asia No. 1, Hussain Al Suwaidi of UAE, 235-179 in the first semi to take on Frawley. Yousif eliminated tour debutant, Abdulrahman Al Jaidah of Qatar, 198-162 in Round 1 and compatriot and youth, Ahmed Al Goud, 218-207 in Round 2. Abdulla Al-Dosery, President of Bahrain Bowling Federation was on hand to present the trophy to the champion. 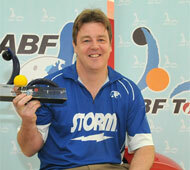 The second leg of this year's ABF Tour will be staged in Kuwait on March 20. Photos by Terence Yaw in Manama.